Eurovelo is a network of 14 long distance cyclo-touristic routes covering all Europe. 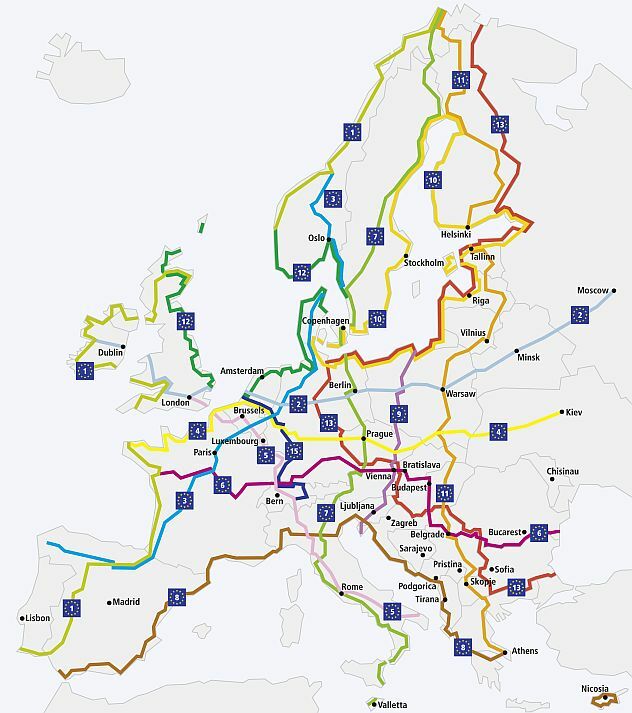 Currently, 45 thousand kilometres of these routes are in operation and the completion of the whole system is planned to be realized by the year 2020 when the overall network length of EuroVelo will have reached 70 thousand kilometres. The EuroVelo routes meet certain fundamental criteria determined by the character of the trails designed for cyclotourism on common tourist (trekking) bicycles. The routes are not designed to be used by mountain bikes or by fast racing road bicycles. They are convenient for slower cyclotourism and recreational cycling, i.e. to the cyclo-tourists doing their tough hundreds of kilometres as well as to one day holiday makers, families with children, elderly people, clients of travel agencies etc. The trails mainly covered by asphalt surface are located on car free roads and paths to the largest possible extent located out of busy traffic. The EuroVelo routes are primarily marked in accordance with the local or national standards and with the EuroVelo standards, i.e. the EuroVelo logo is nicely incorporated in the international marking. This strategy enables leading thousands of kilometres long routes across several countries in line with the local marking standards, a cyclist is thus aware of using a EuroVelo routes and gets the information on which direction to continue. Within its host countries, the EuroVelo trails have no particular status as they are placed on the existing marked cyclotouristic trails being administered by local communities, cycling associations and clubs etc. As a result, these trails are managed by local organisations. The whole EuroVelo project is supervised by the European Cyclists´ Federation ECF and every country involved in the project has a EuroVelo coordinator managing the proper marking of the EuroVelo trails in accordance with the EuroVelo standards, securing the consideration of these trails in the development and marketing activities of tourist industry in regions and checking the state of trails, their marking etc. Slovak Cyclist´ Club (Slovenský cykloklub) in Piešťany is the EuroVelo coordinator for Slovakia. Due to their attractiveness to the cyclists, the EuroVelo trails represent a huge potential for services provided to cyclists and cyclo-tourists (e.g. the trail EuroVelo 6 between Pasov and Vienna is daily used by 1.5 million cyclists, many of them use the tourist services provided on the trail). These services are not highly developed at the moment, however, it is more and more obvious that the services suitable for cyclo-tourists (accommodation and catering in the certification scheme system Cyclists welcome, cyclo buses and cyclo taxis) are rapidly progressing along the EuroVelo 6 Cycling Trail Danube and EuroVelo 13 Iron Curtain Trail and the situation is supposed to be improving continuously.